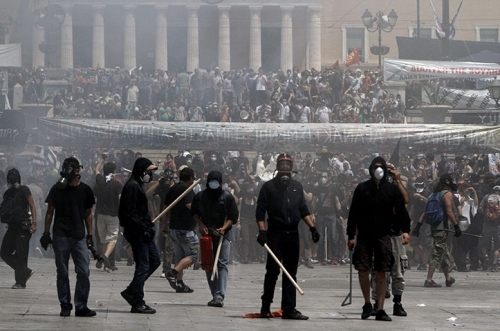 Yesterday (Tuesday), Athens had its first taste of what lies ahead if the measures are passed. Hundreds of thousands marched peacefully upon Parliament, but protests quickly got out of hand as riot police provoked violence from a fringe minority of protesters by firing unprecedented amounts of tear gas canisters at the crowds. Within minutes the square resembled a battlezone, plumes of acrid smoke rising from burning rubbish bins as youths in bandanas, hoods and crash helmets lobbed marble slabs, rocks, broken bits of pavement, incendiary devices – anything they could find – at police. “Our aim,” said Pavlos Antonopoulos, a ponytailed teacher who had marched through Syntagma Square with thousands of trade unionists hours before, “is to demonstrate peacefully. “If there is violence it may well be deliberately provoked because we have heard that the aim of the government is to clear the square before Wednesday’s vote on the measures. Despite the peaceful intentions of the vast majority of protesters, the atmosphere is tense. Thunder clouds are amassing on the horizon as protesters get ready for an historic standoff with police and politicians that will determine the very fate of the country — and with it, the entire eurozone. A new spirit is stalking Greece. Chaos, too, is also present amid power cuts (engineered by militant trade unionists protesting the partial privatization of the public power corporation), lawlessness and a growing sense that the debt-stricken country is not only headed for economic collapse but social disarray.